Retractable Dog Leads – Good or Bad? Retractable dog leads are sold everywhere, in pet shops, market stalls and online. They can range in price from £8 to £100 plus and come in every colour you can think of. You can get shorter, lightweight leads for small dogs or sturdier ones for large dogs and they are sold on the premise that they offer a controlled freedom for your dog while on your walks. But are they really such a good idea? There are a number of risks involved which aren’t obvious at first glance. 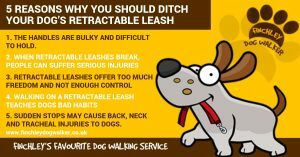 A retractable lead is like a whip cord if a collar or leash clip fails and the thing comes hurtling into your face at speed; think of the broken teeth, broken nose or black eye this could cause. Many retractables are just a thin cord (easy to chew through!) which could potentially cause severe injuries to legs or hands, like friction burns or lacerations, in the event of it getting wound around a limb. This could easily happen in a situation where, for example, the rewind mechanism fails and the cord doesn’t recoil. You start to panic because your dog is perhaps showing aggression towards another dog or is simply heading towards the road, so you grab the cord and the temptation is to wrap it around your fingers. It pulls tight because your dog is pulling on the other end. In extreme cases, it could result in amputation or fracture of fingers. There have also been instances where a retractable lead has caused injury to the dog. As we dog lovers know, a dog doesn’t walk in a straight line, especially if he’s sniffing the ground or bouncing around in play. It’s very common to find the lead tangling around his legs or tail and the cord of a retractable lead can easily cause damage like cuts to the legs or even dislocation of the tail. Then there’s the issue of training and discipline. A dog may be more inclined to pull or ignore commands because he is not in close proximity to you. The danger is that he could take off at speed and pull you over, or you could let go of the lead and cause the dog to panic when the unit clatters along behind him. Imagine the chaos if he runs into the road and the cord becomes entangled around someone’s bicycle wheel and they fall off. While a retractable lead could be a good idea in open areas as long as it used with a harness, a fixed lead is probably better for most situations. Pet Care with a Difference. Next Article Next Article: Are you ready for a Scooby Snack?